Musings and comments on autos, sports, movies, etc. The name “Blazer” has long been part of the Chevrolet family, but the resurrected Blazer SUV for 2019 bears little resemblance to its forebears, which have a history that goes back to 1969 when Chevy launched the K5 Blazer to compete with Ford’s Bronco, among others. The latest edition is no longer a two-door truck with body-on-frame construction but a mid-size crossover SUV, refined and more suited to what consumers are looking for today. Seating five, it slots in between the compact Equinox crossover and the full-size Traverse in Chevy’s stable of SUVs. The new Blazer is offered in four trims with a starting MSRP of just over $30,000 for the base L (including the destination and delivery charges). 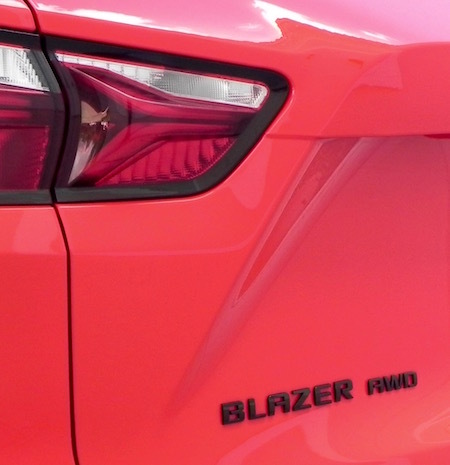 Blazer (or LT) trim adds more features, and a sporty RS model and Premier trim top are at the top of the line. This review is based on the RS that carries a base MSRP of $44,695 (including the hefty $1,195 destination charge) with options running the total to $50,765. The base engine in the Blazer RS is a 3.6-liter V6 featuring stop/start technology and mated to a 9-speed automatic transmission. It is rated at 308 horsepower and 270 pound-feet of torque at a negligible cost in fuel mileage over the 4-cylinder that is standard in lower trims. V6 fuel consumption figures are 20 miles-per-gallon city, 26 highway in V6s with front-wheel drive and 18/25 for those with the available all-wheel drive. The 2.5-liter 4-cylinder is rated at 22/27 but delivers only 193 horsepower and 188 pound-feet of torque. I’d sacrifice the mpg figures for the extra power that the V6 delivers. No, the Blazer RS doesn’t reach Camaro-like performance but it’s not bad for a vehicle that is 191.4 inches long and carries a curb weight of 4,246 pounds (with AWD). 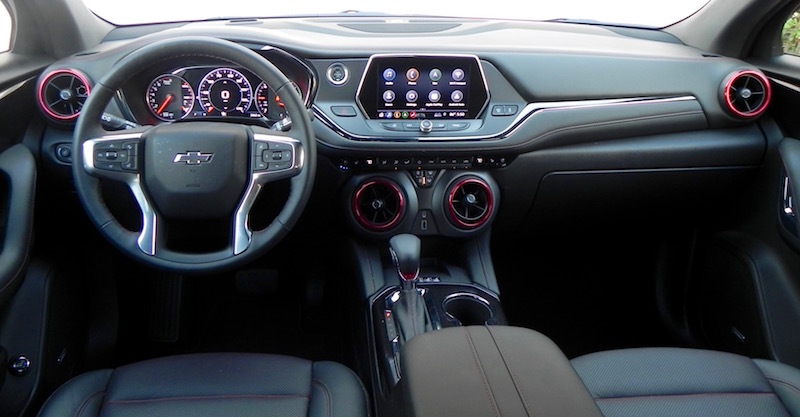 The Blazer’s interior is nice enough for its class, not luxurious but not bare bones either. 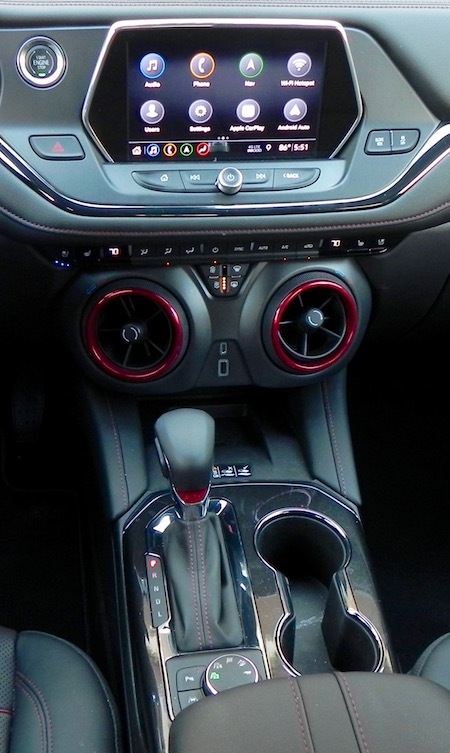 RS models get heated front seats with perforated leather trim as standard, and the red-trimmed adjustable rings on the adjustable front air vents give the RS a sporty feel. 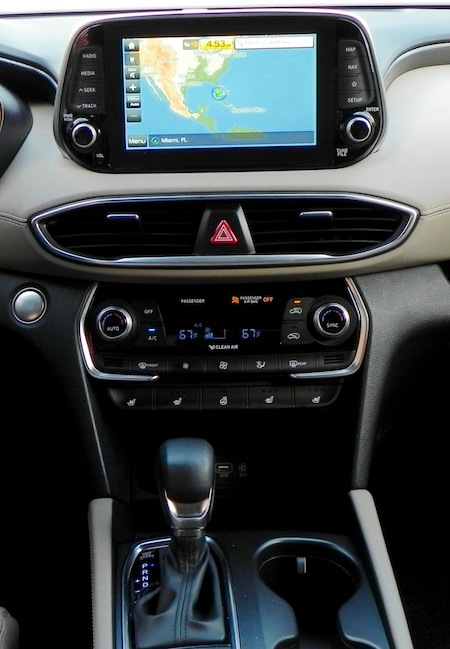 Designers have done an excellent job incorporating the 8-inch touchscreen into the flow of the dash, and the various functions are all user-friendly. Well, at least on the screen they are. 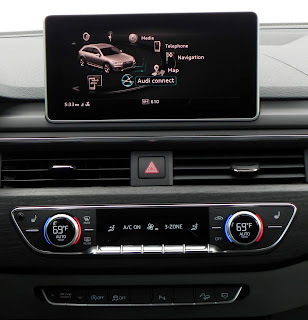 There is a row of black buttons between the touchscreen and the round vents to operate the A/C manually that are on the small side, and finding the even smaller buttons between the two vents on the center stack to adjust the blower can be distracting for the driver. Rarely in South Florida does one have to wear gloves inside a vehicle, but heavy winter gloves I would think would make adjusting the climate control fans somewhat difficult. 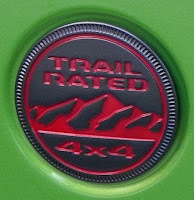 Standard equipment on the Blazer RS includes navigation, keyless open and start, rear park assist and cross-traffic alert, lane-change alert with blind spot warning, HID headlamps, LED daytime running lights, heated outside mirrors with turn-signal indicators, 20-inch wheels (with 21-inchers available), leather-wrapped steering wheel and shift knob, Bluetooth streaming audio and connectivity, dual-zone climate control, 4G LTE wi-fi hotspot, and Apple CarPlay and Android Auto. 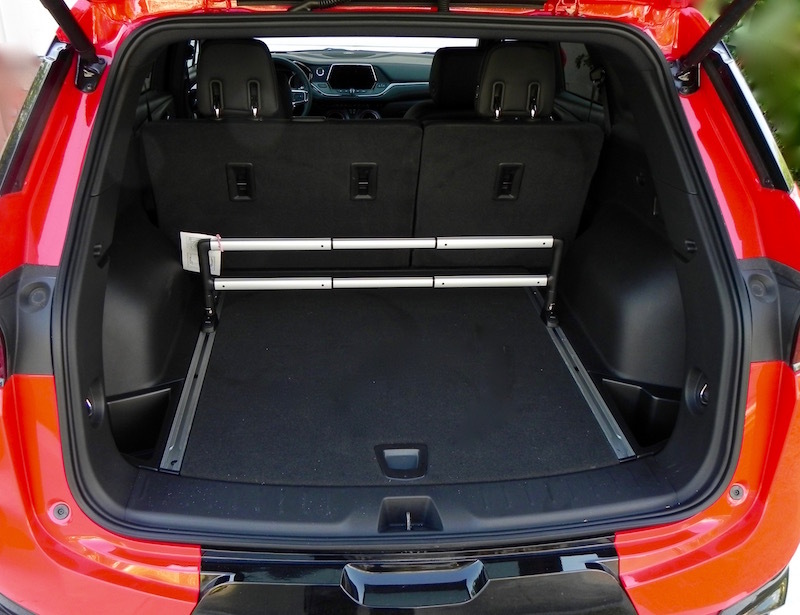 Not overlooking one of the reasons people go for an SUV, the Blazer offers 30.5 cubic feet of storage behind the second row with a maximum of 64.2 feet with those seats folded flat. Wireless charging, heated outboard second-row seats, ventilated driver and front-seat passenger seats, power tilt-and-telescoping steering wheel column, adaptive cruise control, forward collision alert and forward pedestrian braking, and a power sunroof are available in packages. 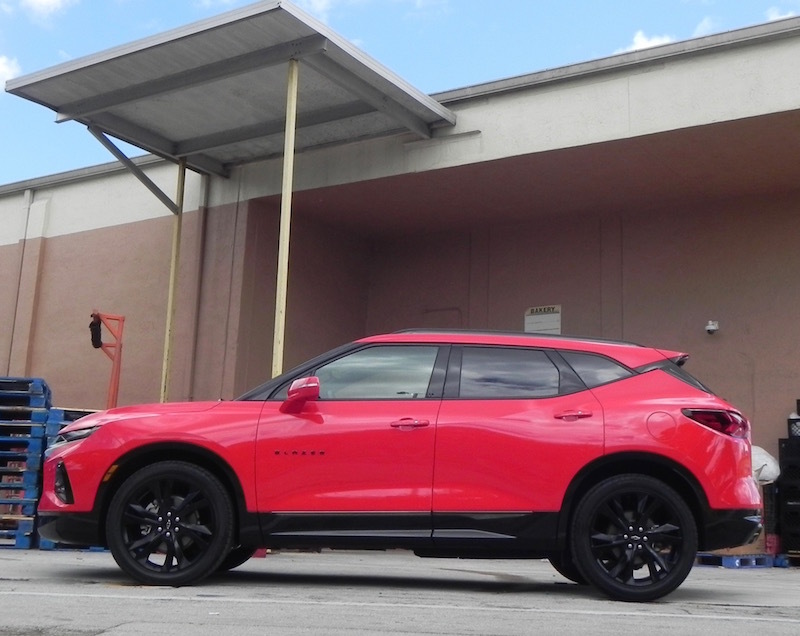 All in all, this Blazer certainly is a much-more civilized version of its predecessors with attractive exterior styling, a comfortable interior, and a quiet, confident ride. What I liked about the 2019 Chevy Blazer RS: The infotainment functions are very forthright and user-friendly. 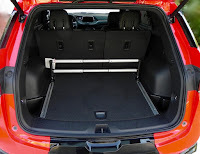 The adjustable divider in the cargo area is a nice touch. It helps keep a full load of items from shifting around. Performance is good for its genre, at least with the V6 engine. 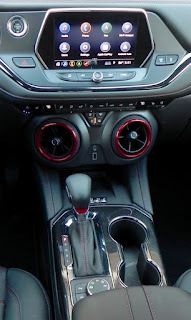 What I didn’t like about the 2019 Chevy Blazer RS: I would like a handy button to turn off the stop/start function. You can defeat it by lightening your touch on the brake pedal, but a switch would simplify things. 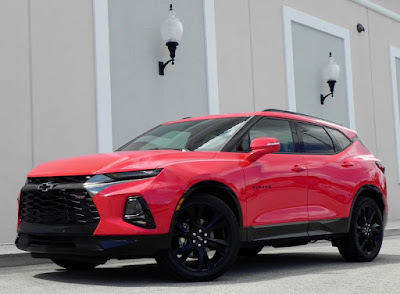 Would I buy the 2019 Chevy Blazer RS? I’d give it consideration. But it faces some very stiff competition in its class, and it likely would come down to whatever kind of deal I could make. Unfortunately, I am not a very sharp negotiator. This goes back far too many years that I care to acknowledge, but once upon a time my friends from high school and I got together with our families for an informal reunion about 20 years or so after our graduation. Our meeting place was a park in our hometown, and it became somewhat of a running joke as the afternoon wore on that each of us showed up in a station wagon. At the time this was the ultimate in automotive domestication, part of the “full catastrophe” cited by Zorba the Greek in the movie of the same name. I’ll pause now while you look it up on Youtube. Back? OK. Let us continue. My point here now is that if that gathering were held today and we were still of that age and with the same brood of young children, chances are that we would be showing up in SUVs/crossovers. For though we didn’t know it then, our station wagons were about to experience a popularity decline that seemingly had them headed for the edge of extinction. Domestic manufacturers pretty much bailed on the segment. Ford even billed its boxy, Flex, which has the profile and look of a station wagon if there ever was one, as a “crossover” when it introduced it a decade ago. But thanks mostly to European automakers, the wagon never completely disappeared, and now it apparently is on a bit of a resurgence. Citing data from Edmunds.com, Bloomberg Business reported that station wagons enjoyed an increase in sales of 29 percent in 2018, trailing SUVs and midsize pickups in growth rate but far ahead of tradition segments like compact cars, midsize cars, luxury cars, etc., which were all in negative numbers for the year. Admittedly, the station wagon’s market share is still small. The volume of 229,000 vehicles sold is less than 2 percent of the U.S. market, but it apparently is getting off its death bed. Buick (TourX) and Lincoln (MKT) are even back with domestic offerings in the segment. The modern wagon is far from the lumbering Wagon Queen Family Truckster that Clark Griswold packed his family into for their cross-country trek to Wally World in National Lampoon’s Vacation. I’d say the 2018 Audi A4 Allroad is among the most striking vehicles I have had the pleasure of driving in recent months. 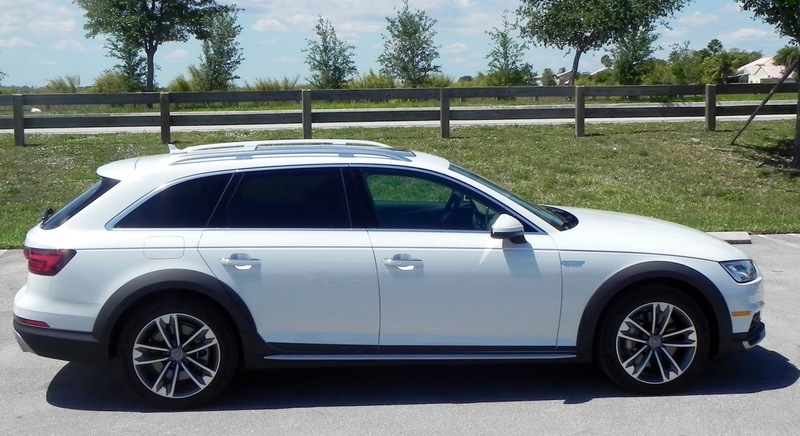 Not surprisingly, combined with its performance and luxurious interior, the A4 Allroad is ranked 1 or 2 among available wagons by such sources as Edmunds.com and U.S. News & World Report. 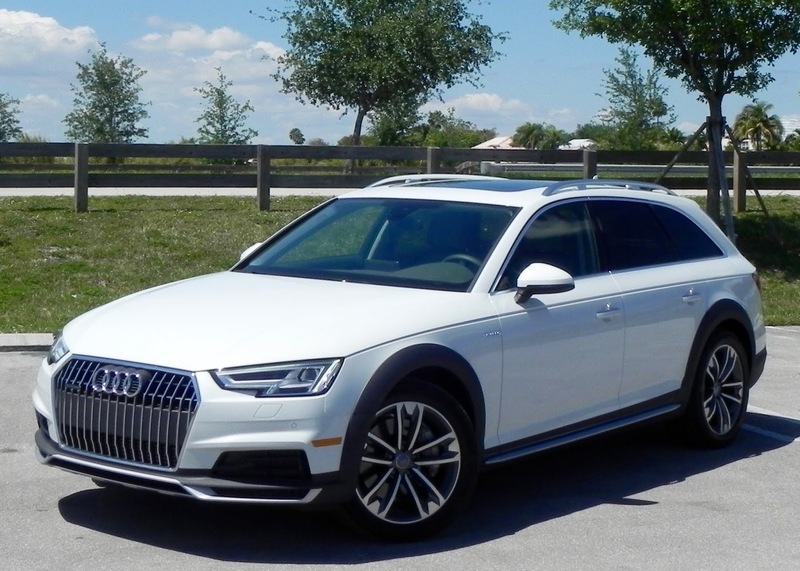 Fully redesigned for the 2017 model year, the 2018 A4 Allroad is pretty much the same vehicle but with heated front seats as standard and some other changes to features in the higher trims. No major changes were made for the 2019 model either, so it may be to do some looking in the used car market if you’re interested in one. The Allroad is offered in Premium (base), Premium Plus, and Prestige trims with a starting MSRP of $44,500. The Premium Plus package adds another $2,700 to that and is well worth it with features such as an upgraded Ban & Olufsen 3D sound system, 8-way power front seats with driver memory, front and rear parking sensors, LED headlights, Audi’s side assist system with pre-sense rear systems that react in the event of collisions from the side or rear, and SiriusXM satellite radio with 3-month trial subscription. 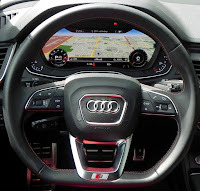 A Navigation and Telematics package adds another $3,000 and includes Audi’s MMI touch telematics system and Audi’s virtual cockpit. Those two packages and a couple of other extras ran the total of my vehicle for the week to $52,750 including destination and delivery, so no, this likely isn’t your grandfather’s station wagon. All A4 Allroads get a 2.0-liter, turbocharged 4-cylinder engine that is mated to a 7-speed automatic transmission with paddle shifters and puts out a healthy 252 horsepower and 273 pound-feet of torque. Set in dynamic mode, it delivers credible throttle response with fuel mileage figures of 22 miles-per-gallon city, 30 highway, and 25 combined. 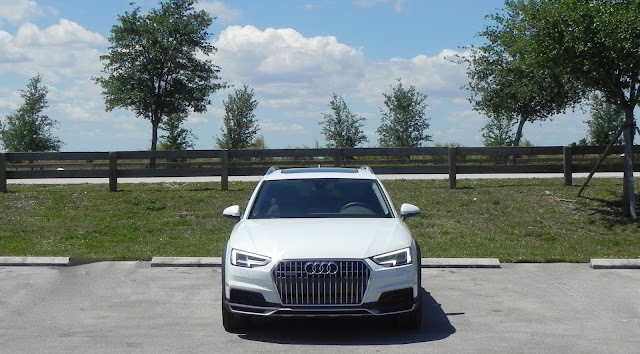 Audi clockers caught the Allroad getting from zero-to-60 mph at 5.9 seconds, which is not your grandfather’s station wagon either. 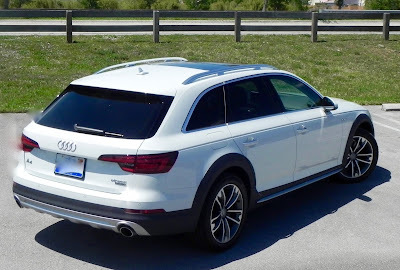 Audi’s quattro all-wheel drive system is standard and though you won’t be traversing the kind of terrain that vehicles like Jeeps and Land Rovers typically take on, you will find the Allroad up to navigating dirt and muddy and snow-covered surfaces and other unpaved roads quite well. Lest we forget that certain functions are expected of a wagon, the Allroad also delivers there as well. It seats five comfortably, and rear stowage capacity is 24.2 cubic feet with the second-row seats in place and 58.5 with them folded. 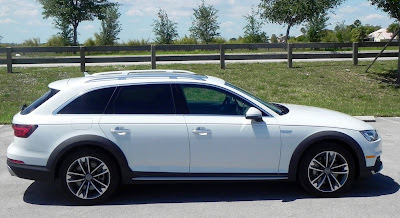 What I liked about the 2018 Audi A4 Allroad: The Allroad handles so well you can forget that you are in a wagon. I love the virtual cockpit and the ability to change settings by flicking your thumb on the “view” button on the steering wheel spoke. What I didn’t like about the 2018 Audi A4 Allroad: The display screen to show settings for Audi’s MMI infotainment system looks like an iPad stuck at the top of the center stack. It’s not a deal killer, of course, but there has to be a better way of incorporating it into the flow of the dash. In fact, I have actually seen better ways in other makes! 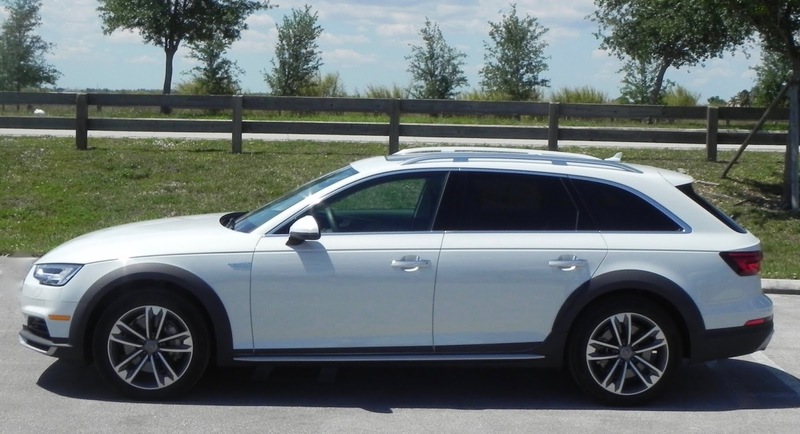 Would I buy the 2018 Audi A4 Allroad? Sure would. It is one of the more expensive wagons on the market today, but it is well worth a look, even if you are looking at a luxury SUV. The Jeep Wrangler may not be the only vehicle with off-roading capability — even luxury manufacturers play in this pool — but it's hard to argue with Jeep’s claim that its Wrangler is “the most capable and recognized vehicle in the world” when it comes to off-pavement adventures. 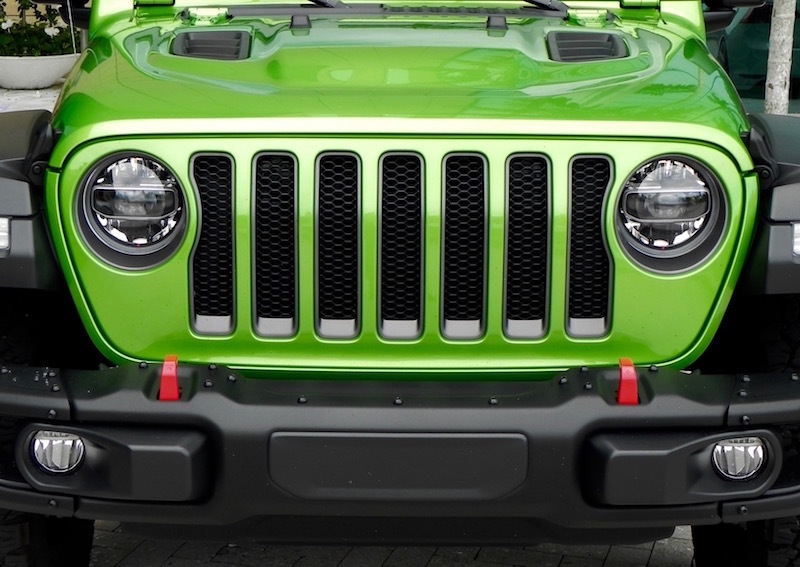 There’s no mistaking what designers had in mind when they introduced the first Wrangler at the Chicago Auto Show in February 1986 as a replacement for its iconic Jeep CJ series, and it wasn’t mere runs to the grocery store. While that holds true for any of the four trim levels offered in the Wrangler lineup, it is doubled down with the Rubicon model introduced in 2003. Named for the famed Rubicon trail in California’s Sierra Nevada Mountains near Lake Tahoe, the Wrangler Rubicon was “designed for ruggedness and was the most capable off-roading Jeep vehicle at the time,” according to a post on The Jeep Blog (www.blog.jeep.com). 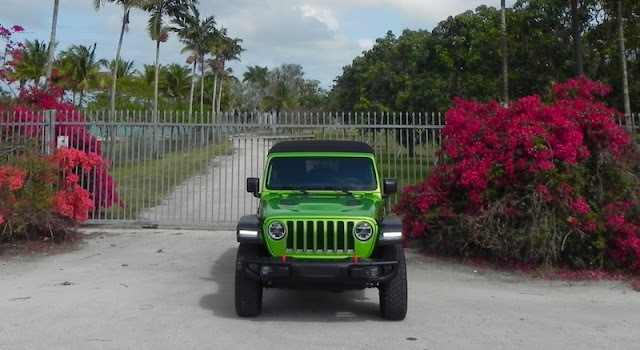 Unfortunately, such challenges are lacking in South Florida, so my week in the Wrangler Rubicon, with the exception of a brief pot-hole filled, dirt-road venture marked by “what are we doing here?” cries from the passenger seat, was spent mostly on pavement. In a situation like that or similar, another Wrangler model — Sport, Sport S or Sahara — likely would satisfy your desires for a husky, off-roader, and you’ll save yourself some money as well. 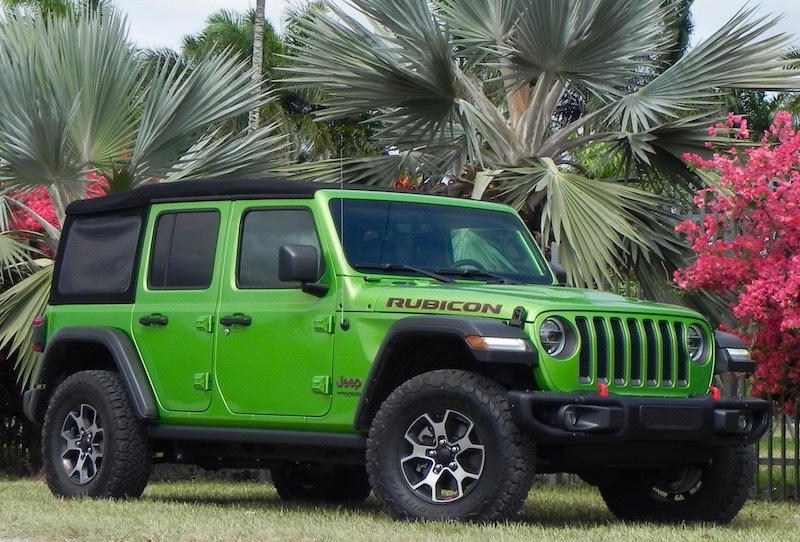 The Limited Rubicon carries a starting price of $41,445 before options and a hefty, $1,495 destination and delivery charge are tacked on while the base Wrangler starts at under $30,000. 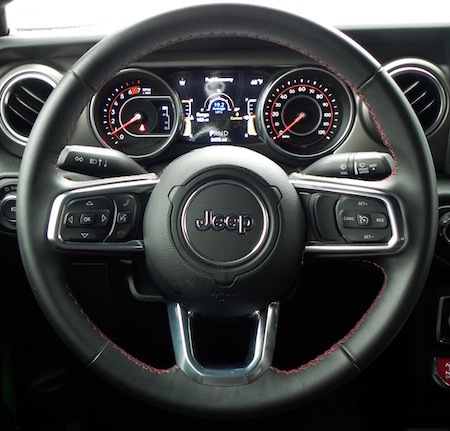 The Pentastar 3.6-liter V6 engine mated to a 6-speed manual transmission is the standard power train on Wrangler models, including the Rubicon, with an 8-speed automatic available as an option. A 2.0-liner turbocharged 4-cylinder also is available and includes the automatic transmission. The V6 produces a bit more horsepower (285) than the 4-banger (270), but the turbo has the advantage in torque with 295 pound-feet to the 260 in the V6. If you really do have the opportunity to off-road a lot, you likely would appreciate the extra torque in the turbo-4, and it has the advantage in fuel economy with ratings of 22 miles-per-gallon city, 24 highway, 22 combined for the 4-door and 23/25/24 for the 2-door. Numbers for the V6 are 17/23/19 with the manual transmission, 18/23/20 for the automatic. The Rubicon gets its extra off-road muscle from such features as the upgraded Rock-Trac NV241, shift-on-the-fly transfer case and standard Dana 44 heavy-duty solid front and rear axles. It also gets about an extra inch of ground clearance with 10.4 inches to the 9.7 inches for the Sport and 10.0 for the Sahara. 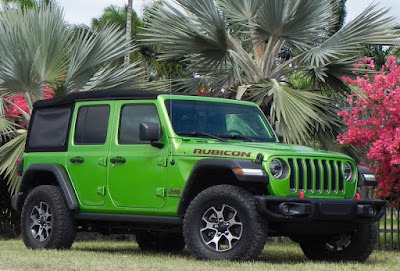 Standard features on the Limited Rubicon include remote keyless entry, power windows with one-touch down, halogen head and fog lights, Apple CarPlay and Android Auto connectivity, an 8-speaker sound system, dual-zone air conditioning, and electronic roll mitigation. 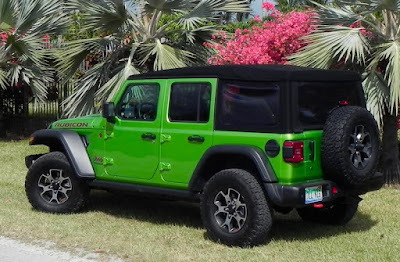 A Sunrider soft top is standard with a Premium soft top available. It’s removable, but after spending a few minutes looking at a Youtube video showing the process, I decided it wasn’t worth it for just the few days I would have the vehicle. The process for getting it back on and correctly in place was, frankly, something I didn’t want to fool with. A power hard top is available as an option. 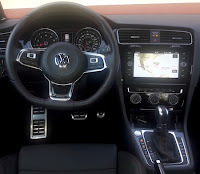 Adding such extras as leather-trimmed bucket seats and leather-trimmed parking brake handle and shift knob, LET lighting group, a technology package that included an 8.4-inch display for navigation (very intuitive to operate), safety features like blind-spot detection and rear parking assist ran the total for my test vehicle to $53,900. 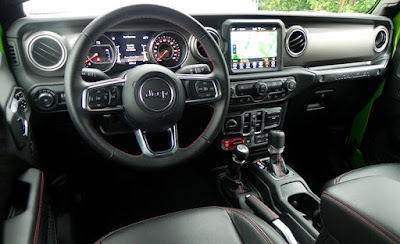 What I liked about the 2019 Jeep Wrangler Limited Rubicon: Despite its rugged appearance and capability, the Limited Rubicon is still rather civilized with lots of nice features and technology, though some come as options that drive up the price. It’s an attention-getter, for sure! What I didn’t like about the 2019 Jeep Wrangler Limited Rubicon: It’s more adept at rock crawling than it is on expressway commutes. The rugged all-terrain tires mounted on 17-inch wheels are more suited to off-road than highway pavement. 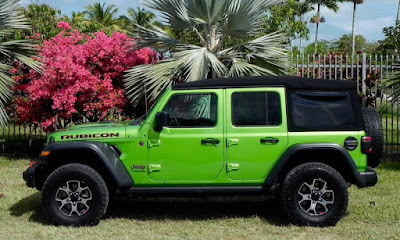 Would I buy the 2019 Jeep Wrangler Limited Rubicon: Living in South Florida, no, I probably wouldn’t. Other Wrangler trims are good for any off-road obstacles one encounters in my neighborhood. 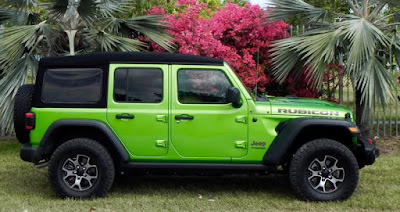 But there is no question if you like ultimate off-pavement challenges, the Wrangler Rubicon is worth your consideration with price being the determining factor. Fuel economy may be the No. 1 reason many people shop in the compact class, but it’s not the only one. In what could be considered a “sub-grouping” in the segment, so-called “pocket rockets” — compacts and sub-compacts tuned for performance — throw a bit of spirit into the mix while still offering decent fuel economy. Volkswagen’s Golf GTI has been a prominent player in this field since it was brought to the U.S. in 1983, the second generation of the snappy little hatchback that had been serving European audiences for the previous eight years. It especially appealed to those buyers with champagne tastes when it comes to performance but were living on beer budgets. Peak torque from the 2.0-liter, turbocharged 4-cylinder engine is 258 pound-feet from 1500 rpm through 4500. 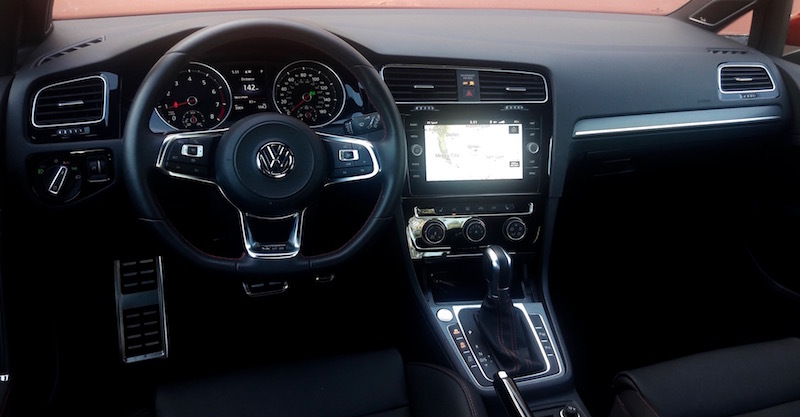 Mated to a 6-speed manual transmission, the GTI still offers fuel mileage numbers of 24 miles-per-gallon city, 32 highway and 27 combined while those equipped with the optional 7-speed DSG automatic boasts numbers of 25/31/27. Those aren’t spectacular numbers for the segment, but you’ve got to sacrifice something to get that performance. That power train is common to all trims as is the MIB II touchscreen infotainment system. You can flip through different driving modes (Normal, Comfort, Eco, and Sport) by pushing a button on the console. It’s right next to a button to turn off the Stop-Start feature on models equipped with the automatic transmission. The GTI’s interior is nice, very nice actually. A special GTI interior with red ambient lighting, leather seats with red stitching, and illuminated door sills, and a black headliner add a touch of class to the nicely appointed cabin. There’s also lots of space for passengers (just over 41 inches of legroom up front and 35.6 for the second row) and your stuff. Cargo room behind the second row is 22.8 cubic feet. Fold those seats and it’s a spacious 52.7. 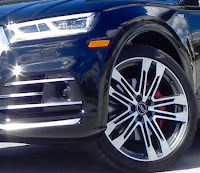 The top-of-the-food chain Autobahn trim, which served as my test vehicle for the week, comes with long list of standard equipment that includes such features as a crash response system, rear-view camera, 18-inch alloy wheels, automatic LED headlights and LED daytime running lights and fog lights, rain-sensing wipers, panoramic moonroof, GTI grille, bumpers, side skirts, and rear spoiler, dual-zone climate control, paddle shifters, and technological features like navigation, a Fender premium audio system, Bluetooth connectivity, and adaptive cruise control. Those features make options pretty much unnecessary, but they do drive up the price. Base MSRP for the GTI Autobahn is $37,095. Add in the $895 destination charge and the total is $37,990. That number may be out of range for those shopping on a “beer budget,” but you don’t have to go for the Autobahn trim. The SE model starts at just over $28,000 counting the destination charge. What I liked about the 2019 Volkswagen Golf GTI 2.0T Autobahn: It’s a fun car to drive, especially when Sport mode is engaged. 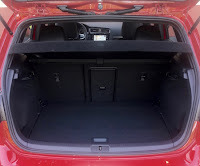 It’s comfortable enough and offers pretty decent storage in the back even without the second-row seats folded (easily accomplished). The Autobahn trim comes with a lengthy list of standard equipment. 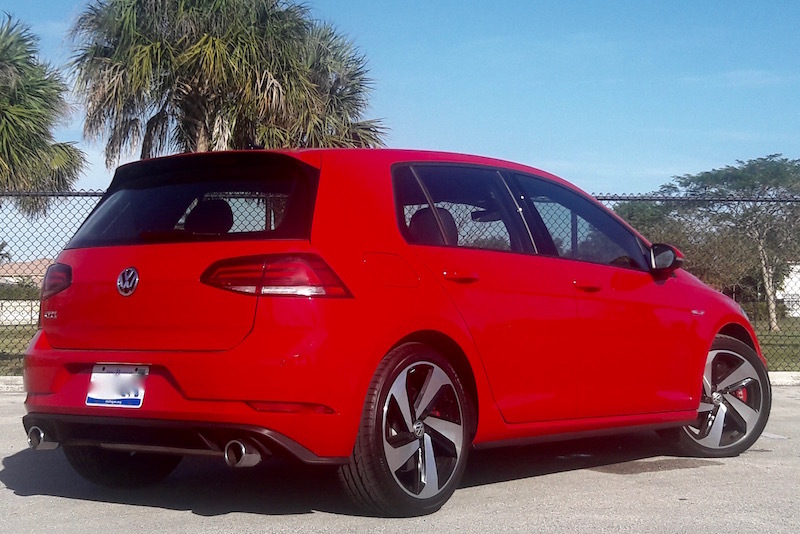 What I didn’t like about the 2019 Volkswagen Golf GTI 2.0T Autobahn: Road noise kind of drowns out the audio. Some techno features require extra steps to perform basic functions like changing the clock, and the touchscreen can be overly sensitive. It’s easy to hit the screen surface and change a station when you’re turning up the audio volume if you’re not careful. 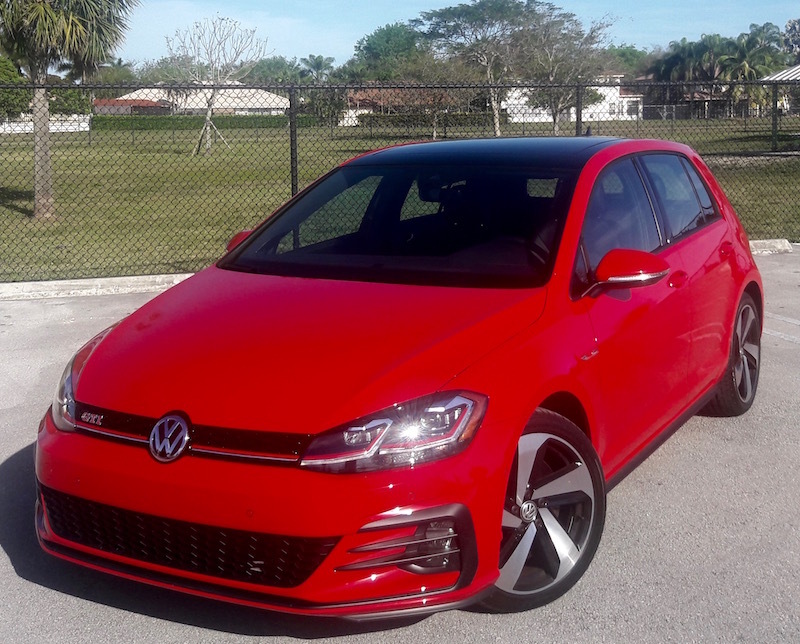 Would I buy the 2019 Volkswagen Golf GTI 2.0T Autobahn? 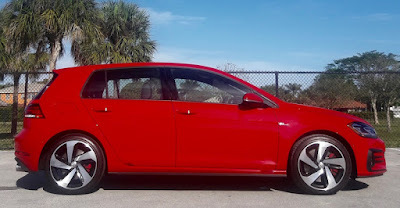 I wouldn’t personally because I am not a fan of compact hatchbacks in general, but if that is the kind of vehicle you are looking for, this should be on your list. Cost no doubt plays a huge part. The GTI is among the most expensive offerings in its class. — The latest in technology will be available. It will be fussy, and sometimes frustrating, to operate. — The cabin will live up to the highest standards of luxury while giving you the feel of a high-class English gentleman’s club. — It will go like a bat out of hell. 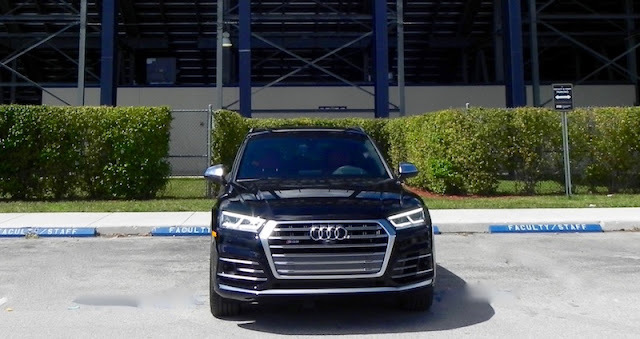 The 2019 SQ5 from Audi encompasses all three. 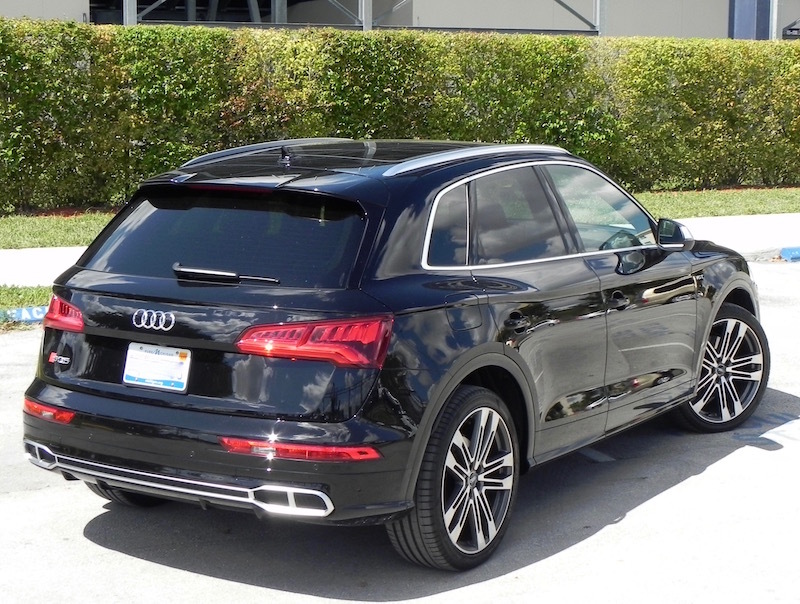 While Audi touts the “sporty performance” the base Q5 delivers. the SQ5 simply ups the ante. 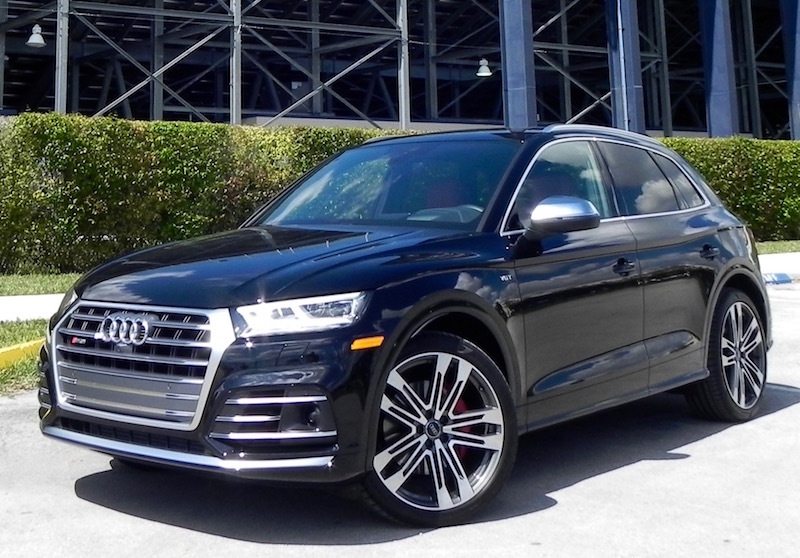 The 3.0T V6 in the SQ5 kicks horsepower and torque up to 349 and 369, respectively, from the 252/273 the 2.0 turbo 4-cylinder in the Q5 offers. 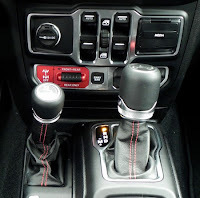 And you get a smooth-shifting 8-speed Tiptronic transmission instead of the 7-speed that is mated to the 4-banger. The zero-to-60 mph time for the 3.0T has been reported at 5.1 seconds, nearly a second quicker than that for the Q5 and its 2.0 turbo and with fuel economy still at a respectable 19 miles-per-gallon city, 24 highway, 21 combined. So, yeah, it can go like that bat. And, it does so in comfort and quiet — unless you switched driving mode from Comfort to Dynamic, thereby changing the exhaust sounds from subtle to sporty. 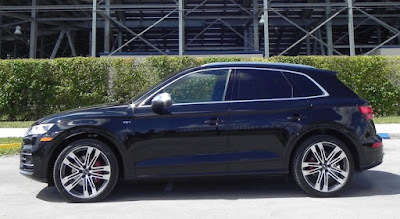 Not that “sporty” will make the SQ5 sound like a 12-cylinder with a broken muffler, but it will be a bit more throaty. Probably the most distinguishing characteristic of the SQ5s interior is the available Audi virtual cockpit. 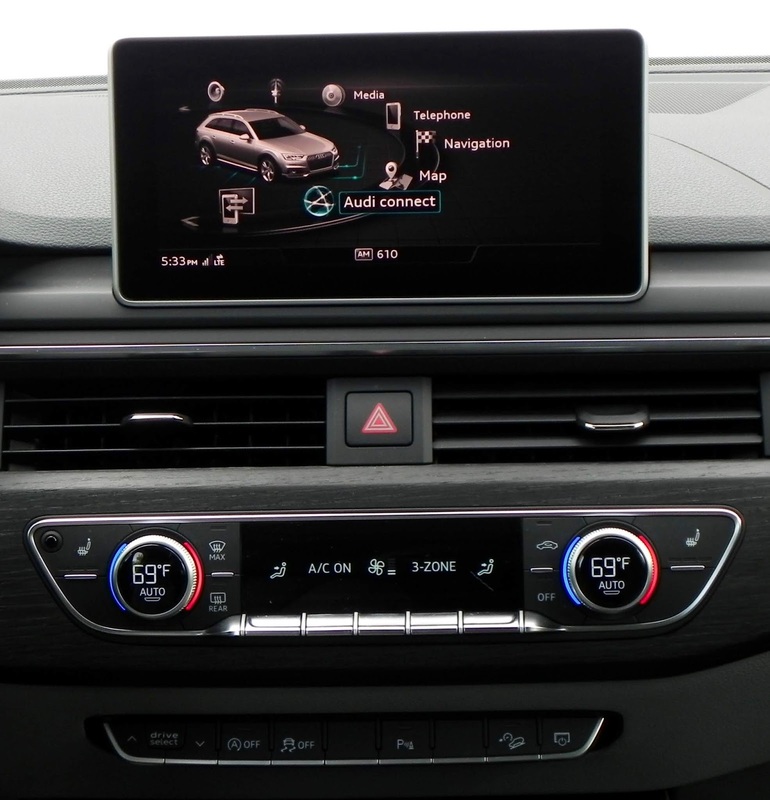 This 12.3 inch display is right in front of the driver and allows the driver to scroll through — using buttons on the steering wheel — several functions for desired information, from radio settings to trip logs with fuel mileage to full navigation maps. With the tachometer and speedometer reduced in scale, the driver has a complete map displayed right between the steering wheel spokes, eliminating the need to use the map on the screen at the top of the centerstack. At a time when Smart phones are driving people away from automobile navigation systems, the virtual cockpit may bring them back. 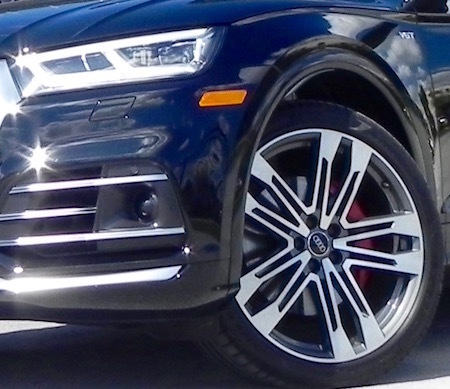 Standard equipment for the base MSRP for the SQ5, already a hefty $54,300 over the base Q5’s $42,950, includes the quattro all-wheel-drive system common to the brand, 20-inch wheels, full LED headlights and taillights, 6-way power adjustable front seats with 4-way power lumbar, quilted Alcantara leather seats, three-zone climate control, flat-bottom steering wheel with paddle shifters, and a rearview camera. The exotic stuff that makes the SQ5 really special comes in standalone or optional packages like the Prestige Package (a head-up display, dual pane acoustic front side windows, a premium Bang & Olufsen sound system, Audi MMI navigation with MMI touch and a top view camera system, which gives you a confident feeling when pulling out of a parking space), Sport Package (red brake calipers, adaptive air suspension, sport rear differential), Driver Assistance Package, Nappa leather interior with diamond stitching and a leatherette covered center console, Dynamic steering (which I could do without), and 21-inch, 5-double spoke wheels. And that stuff comes at a cost. The final price of my test vehicle up to $68,175 including the $975 destination and delivery. That’s a pretty good jump from the base Q5. That’s also something else you can count on when it comes to a German luxury car. 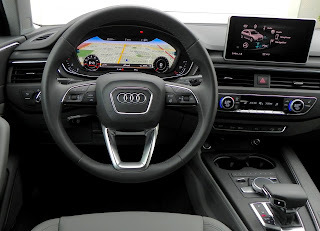 What I liked about the 2019 Audi SQ5 3.0T: I really like Virtual Cockpit feature that puts a duplicate map for navigation in the middle of the instrument panel right in front of the driver's eyes. It's part of the Prestige package. The Virtual Cockpit displays other functions but the map alone makes it worth the extra $4,200. What I didn’t like about the 2019 Audi SQ5 3.0T: The response to voice commands when setting a destination on the nav system was erratic, and putting in a destination manually takes a while. The dynamic steering is kind of quirky. The tugs I felt on occasion could have been the lane-keeping system in the Driver Assistance Package, but I was dead center in the lane. Would I buy the 2019 Audi SQ5 3.0T? Yes. If you’re shopping in the compact luxury class, it definitely has to be on your list. 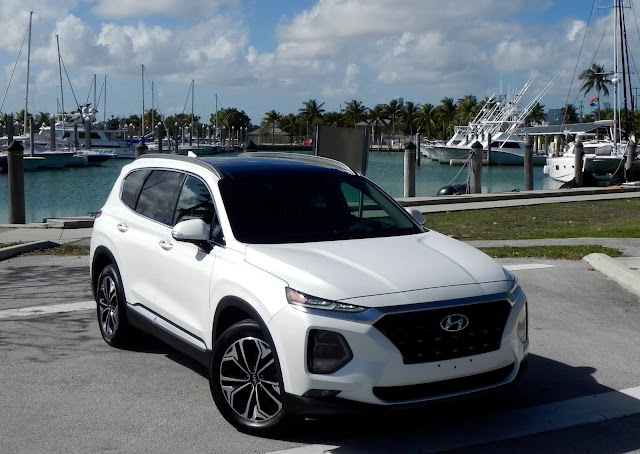 The Santa Fe no doubt has had a prominent role in the resurgence Hyundai has experienced in the U.S. over the last two decades with sales of over 1.6 million since the South Korean automaker introduced the crossover SUV in 2000 as a 2001 model. As it goes into its fourth generation as a 2019 model, the Santa Fe has become the company's best-selling SUV in America, ranking No. 10 in SUV sales in the U.S. for 2018 despite an overall drop of 12.1 percent from the previous year. The Santa Fe has “grown up” considerably with a more mainstream exterior appearance than the funkiness of the first-general models. 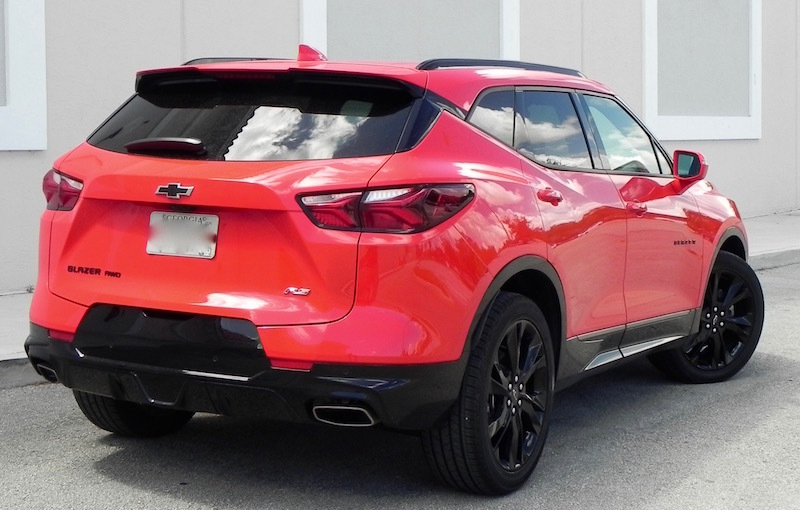 Even those shopping in the luxury midsize segment might want to give the fourth-generation Santa Fe more than a cursory glance. 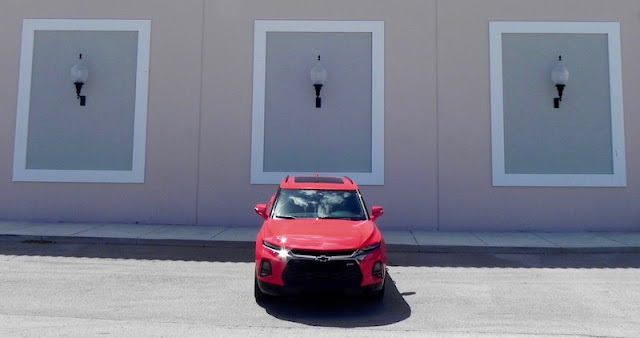 The 2019 Santa Fe has a slightly wider stance than its predecessor and at 187.8 inches is longer by 2.8 inches, giving it a bolder, more aggressive profile that is accented by cat-like LED daytime running lights positioned above the LED headlights. With the extra length, front legroom is expanded to 44.1 inches from 39.6 and second-row legroom to 40.9 from 39.1. 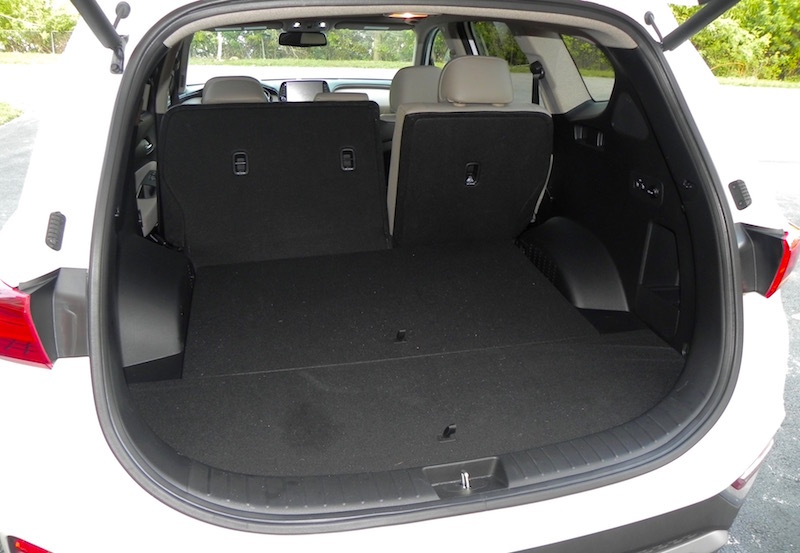 Overall passenger compartment volume is 110.7 cubic feet compared to 108.0 in the 2018 Santa Fe, though cargo capacity remains the same (35.4 cubic feet behind the second row, 71.5 with the second-row seats folded. 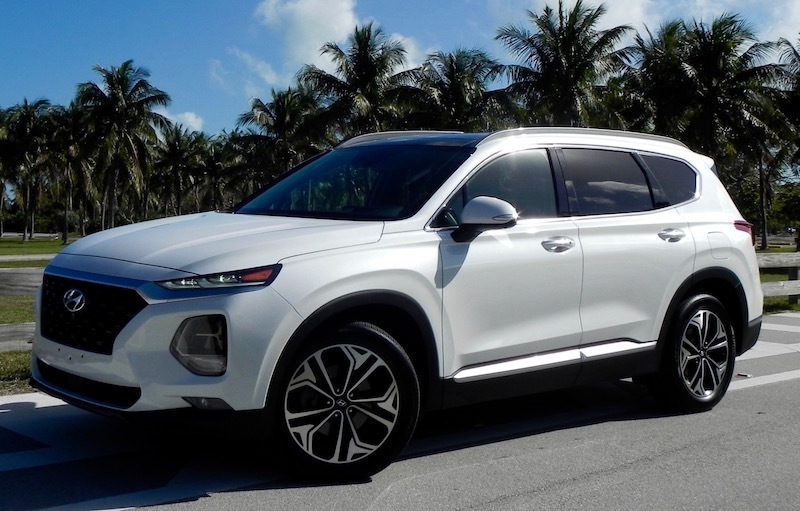 Hyundai has simplified the nomenclature for 2019 with the two-row “Santa Fe” model replacing the previous “Santa Fe Sport” and three-row models now called “Santa Fe XL.” It helps eliminate confusion over which model is which. 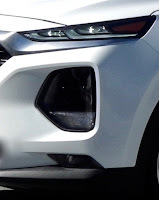 Including the engine choices, the Santa Fe comes in seven trim levels starting with the base SE followed by the SEL, SEL Plus, Limited, Ultimate, Limited 2.0T, and Ultimate 2.0T. The latter two models get a 2.0-liter turbocharged 4-cylinder engine that pumps out 235 horsepower at 6000 rpm and 260 pound-feet of torque from 1450 to 3500 rpm. The base engine in the other trims is a 2.4-liter 4-banger with 185 hp and 178 lb.-ft. of torque. The engine is mated to a new 8-speed automatic transmission. My vehicle for the week was the Ultimate 2.0T edition with the optional all-wheel drive system, and for that I am thankful. The extra power gave the Santa Fe a nice, lively performance while delivering fuel economy of 19 miles-per-gallon city, 24 highway, and 21 combined. When set in Sport mode, the performance was reminiscent of the 3.5-liter V6 Santa Fe I once owned. The Ultimate also comes with a long list of standard features that really add to the cabin’s ambiance. Among them are 4-way power lumbar support for the front seats, heated and ventilated front and heated rear seats with leather seating surfaces and contrasting stitching, proximity key and push-button start, navigation with an 8-inch touchscreen, Android Auto and Apple CarPlay, lane-keeping assist, panoramic sunroof, hands-free liftgate, surround-view camera, and forward collision avoidance with pedestrian warning. No need for for extras to inflate the $39,905 MSRP (including $125 for carpeted floor mats and $980 destination and delivery). That does put the new Santa Fe into a whole new pricing range from the early days, but SE models start in the mid-$20K range. 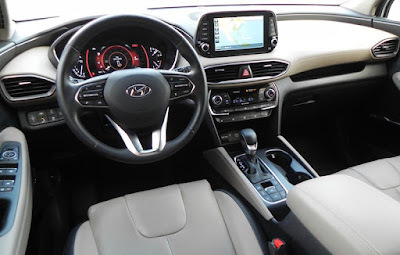 What I liked about the 2019 Hyundai Santa Fe Ultimate 2.0T: The cabin is quiet, roomy, and comfortable, and controls are placed in a logical manner. Many functions (turning off the stop/start system, selecting drive mode, setting the parking brake, etc.) are operated with buttons on the center console. A long laundry list of standard equipment eliminates the need for options. Legroom in the second row is a generous 40.9 inches. 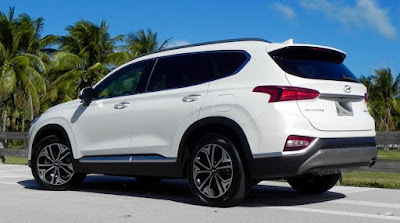 What I didn’t like about the 2019 Hyundai Santa Fe Ultimate 2.0T: Frankly, I couldn’t find much of anything negative about this version of the Santa Fe. That said, it would be nice if the settings mentioned above (driving mode, stop/start function) would remain as you set them instead of reverting back to normal when you restart. Would I buy the 2019 Hyundai Santa Fe Ultimate 2.0T? Definitely. You aren’t going to find many SUVs with this many quality features with an under-$40,000 MSRP.